On March 20th, Spring officially arrives! On March 22nd, Robert Sierra’s Mambo 7/16 arrives in New York City with the Artisan Quartet, when they feature it in their Carnegie Hall debut at Weill Recital Hall. 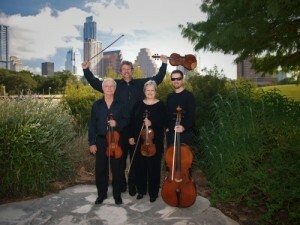 “The Artisan Quartet first performed Mambo 7/16 last June at the Victoria Bach Festival in Texas,” explains violinist Paula Bird. “We spent a great deal of time perfecting the rhythmic clarity, and during the process of mastering the technical and rhythmic challenges, we fell in love with the piece. The Mambo is an aggressive and brash Cuban dance form; however, any dancer who dares to dance to Sierra’s ‘mambo’ with its uneven 7/16 meter might end up with a sprained something somewhere! The work is obviously very new but evokes the timelessness of a bustling marketplace or that of a dense and exciting jungle. We think it is two-and-a-half minutes of pure fun!” Mambo 7/16 was commissioned by the Cuarteto Latinoamericano, who premiered the two-minute work in 1998 in Mexico City. In April, Sierra’s music travels south to “Music City” when Nashville Symphony music director Giancarlo Guerrero leads three performances of Sierra’s Fandangos and Sinfonía No. 4 from April 19th – 21st. “I programmed Fandangos and Sinfonía No. 4 together on this concert, along with Chabrier’s Habanera, because all three pieces are based on different dance styles,” Guerrero shares. “In addition to incorporating the notion of dance, all three of these pieces represent the flow of ideas and cultural trends between the Old World and the New World…As a native of Puerto Rico, Roberto understands this kind of cultural exchange innately…In Fandangos, Roberto connects with the music of Spain, basing his piece on the 18th century dance — in particular, composer Antonio Soler’s Fandango for solo harpsichord. But he takes this source material and gives it a fresh, vivid interpretation, turning it into an exciting orchestral showpiece. In his Sinfonía No. 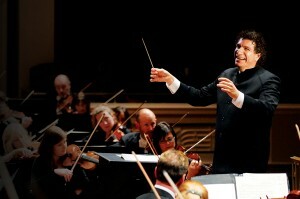 4, Roberto continues his exploration of the symphonic form, taking equal inspiration from the great Classical and Romantic composers, while introducing distinctly Latin elements that reflect his own background – not just the Cuban Bolero in the third movement, but the clave rhythm, which drives the work’s final movement.” After the series, the Nashville Symphony will record Fandagos and Sinfonía No. 4 for future release on Naxos. More April news: In addition to Nashville’s concerts, Sierra’s music will played several times during the month. On the 9th, the Deering Estate Chamber Players feature the chamber work Kandinsky during the 2012 Cutting Edge Concerts New Music Festival at New York’s Symphony Space. Inspired by the famed artist’s paintings and premiered in 2004 by the Diaz Trio at the Library of Congress, Kandinsky is an 11-movement suite for varying combinations of violin, viola, cello, and piano. On April 12th, soprano Dina Kuznetsova performs the vocal chamber piece Songs from the Diaspora at La Musica International Chamber Music Festival in Sarasota, FL. April 14th brings the Binghamton Philharmonic’s (NY) performance of Alegria conducted by José-Luis Novo; and, on April 15th, the Prairie Winds offer Salsa para vientos at the Norton Concert Series near Chicago.